Happy Halloween! 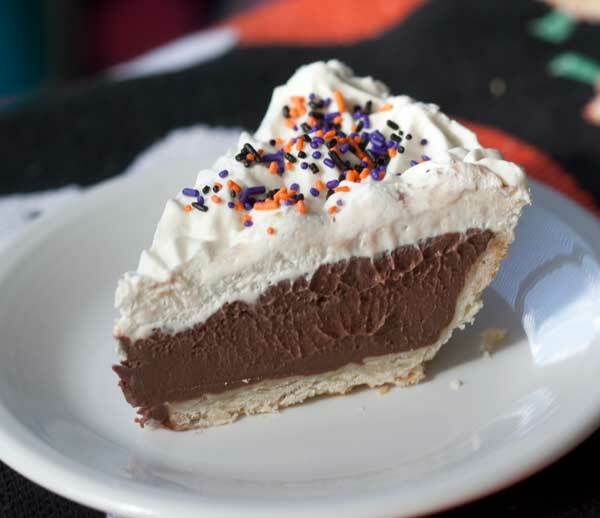 To celebrate, here’s a not-too-scary new “diner style” chocolate cream pie. I’m calling it diner style because the first thing I thought when I cut it was that it looked like something a diner would put in a revolving pie showcase rack. There’s just so much chocolate filling! The big, billowy pillow of meringue you’d find on a diner style chocolate cream pie is missing, but you can easily fix that by making the variation from King Arthur, where I originally found the recipe. They have a version that uses egg whites, but for this pie I used freshly whipped cream. Diner style chocolate pie might be my favorite chocolate cream pie yet. The recipe is straightforward and easy, and the pie has a truly balanced flavor and texture. It’s a little more expensive to make given it calls for a half pound of bittersweet chocolate, but on the other hand it’s a great way to show off good quality chocolate. Next time I make it I might even vary the flavors and use orange or hazelnut flavored chocolate. Now we just have to finish this one, but it shouldn’t be too difficult. Deep dish chocolate pie made with a half pound of good quality bittersweet chocolate. Combine the chocolate and butter in a large heat-proof mixing bowl. In a large saucepan (3 quarts) off heat, combine the cornstarch, sugar, cocoa powder and salt. Whisk in egg yolks, then add 1/4 cup of the of the cream and whisk until smooth. Whisk in another 1/4 cup of the cream until smooth. Transfer mixture to stove top and set over medium heat. Whisk in remaining 1/2 cup cream, then gradually add the 2 cups of milk, whisking all the while until mixture begins to boil. Let boil for 1 minute, gently whisking all the while. Remove from heat and pour over the chocolate and butter. Stir until fully mixed and smooth, then add vanilla extract and instant espresso if using. Put a piece of plastic wrap over the pudding mixture and let it cool at room temperature for about an hour or until it is cool enough to put in the refrigerator. Refrigerate until fully cooled, then transfer mixture to the pie shell. Whip the cream with the sugar and add vanilla. Pipe around edges of pie or if desired, spread over the top. I made this for a Valentine’s Day dessert and it was OMG good. Rich and creamy and sooooo chocolatey! Easy to make, too.